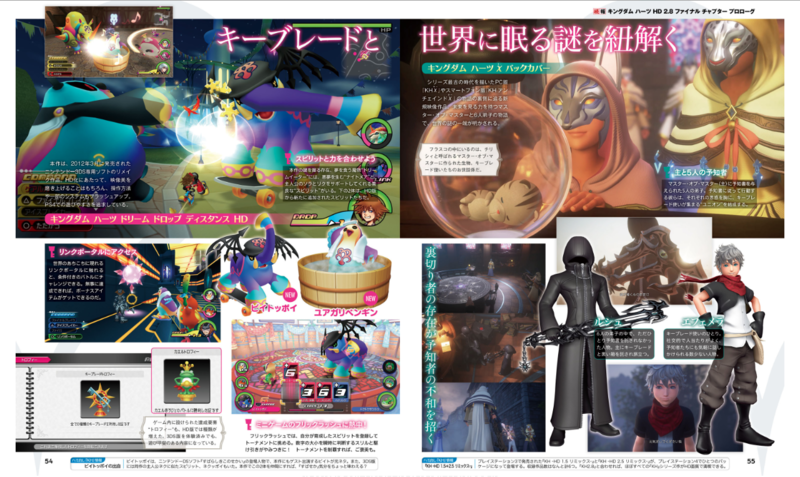 News ► KINGDOM HEARTS 2.8 in Weekly Famitsu! 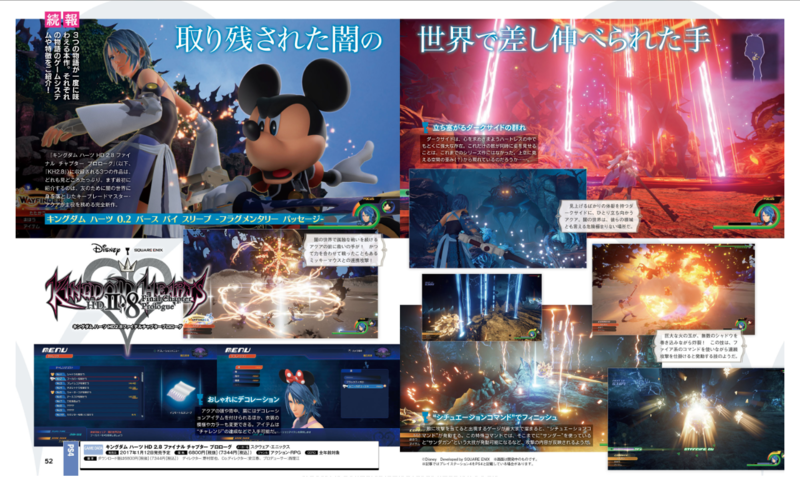 As we've reported yesterday, KINGDOM HEARTS HD 2.8 Final Chapter Prologue is featured in this week's issue of Famitsu, showing off 0.2 Birth by Sleep's combat system, minigames and new Dream Eaters for Dream Drop Distance HD, and giving us our first look at Luxu and Ephemer in Back Cover! Update: Thanks to Zephyr, we have translations for the KINGDOM HEARTS HD 2.8 Final Chapter Prologue scans from Famitsu! “Lending a hand for someone left behind in the Realm of Darkness." Three stories that can all be experienced in this work. We will introduce the story, game system, and more! KINGDOM HEARTS HD 2.8 Final Chapter Prologue is one of the three works in this game which features many attractions. First, we introduce a Keyblade Master who fell into the Realm of Darkness for a friend. This is a completely new work featuring Aqua as the leading role. Continuing the lonely fights within the Realm of Darkness, a helping hand appears before Aqua! Mickey Mouse joins forces and combines their strength together to perform a team attack! Aqua’s head, back, shoulders, etc. can be customized as well as the costume’s pattern and color. These items may be available through completing ‘Challenges’. Darksides are particularly powerful beings among the Heartless who roam about for hearts. Multiple figures of these appearing at the same time have not happened before in the series. They seem to appear from a spatial distortion from the sky…? Aqua confronts them alone as she looks up at the Darkside. The Realm of Darkness is an extremely dangerous place and it can be said that it is also their home origin. A huge fireball traps countless of Shadows! This technique seems to be activated when the Fire command is used continuously. A ‘Situation Command’ will be activated when the accumulated gauge appears to be maxed while fighting enemies. With this special command, it seems the the type of attack will also be reflected. For example, when you are using Thunder, it will activate a great attack such as ‘Thundagun'. This work is a remaster of the Nintendo 3DS exclusive released in March 2012. Upon HD remastering, not only did we refined the graphics but we also brushed up the controls and other systems. We pursued for ease of play on the PS4. Beings that hold the key in this game are creatures that eat dreams called the ‘Dream Eaters’. There are the ‘Nightmares’ that are born from bad dreams as well as the friendly ‘Spirits’ that support Sora and Riku. Below are two new additions in the HD version. By accessing link portals that appear around worlds, you can challenge battles with certain conditions. If achieved successfully, bonus items can be gained. Proof for obtaining all types of Keyblades. Proof for defeating Lord Kyroo in battle. Trophy elements are also updated in the HD version. Even though you may have experienced the 3DS version, it has content for more replayability. In the heat of the Flick Rush mini game! In Flick Rush, you can partake in tournaments by registering your Spirits you’ve trained. There is thrill for strategically using your numbers wisely; it is really addictive! If you win the tournament, there will be rewards. A new video work that summarizes the story behind the PC version of KH χ and the smartphone version of KH Unchained χ. It draws upon the oldest timeline in the series. It is a tale of the Master of Masters and his 6 apprentices that have the ability to see into the future. Records of the mystery of the world are revealed. In the flask is a creature created by the Master of Masters called Chirithy; whom look after Keyblade wielders. Five apprentices were given a book from the Master of Masters. Because of a forewarning, they begin to form unions of Keyblade wielders. Among the six apprentices, he was not entrusted with the Book of Prophecies. He was entrusted to travel around with his Keyblade and a black box. One of the Keyblade wielders. He is one of the few people who can easily speak with the Foretellers. Does that elephant Dream Eater have Reaper wings and Beat's beanie? Also look at Ephemer. What a goddamn cinnamon roll. edit: forgive me, I haven't been keeping up with the news, this is all new info to me. ephemer look cool and luxu looks short by the way is that pengunie taking a bath? Look at the son... he is so cute. But being next to Luxu... it feeds into theories. Have their VA's been confirmed and I just missed it? Otherwise, we can't be certain. We've heard both of them speak once. The penguin is very straightforward. Yuagaripengin is "Penguin after a bath" because haha penguins in hot baths. Precious Dandelion Child!!!! I must hug him! Also Luxu's hood looks like a hand puppet. Ephemer looks great i expected him to be more short but whatever. Urrrghh that keyblade. It's taunting me. After all these years, I just want to know what its name is, so we don't have to call it Xehanort's Keyblade anymore. Ephemer looks fantastic. I can't wait to see Skuld's render and/or just see her in Back Cover in general. Same, dude. Sick of calling it "Xehanort's Keyblade". I'd never thought I'd see the day where an elephant would ride a skateboard while a penguin is taking a bath. Elephant with WINGS Don't forget the WINGS! Ephemer looks freaking adorable. Are there any good translations of these out yet? My Japanese is a little rusty. Meh, I just call Xehanort's Keyblade "Lustful Ambition"